Seit meiner Zeit bei der Heinrich-Böll-Stiftung beschäftige ich mich immer mal wieder mit diesem spannenden und in der Öffentlichkeit noch nicht wirklich breit debattierten Thema. Unten dazu eine (etwas ältere) Themenseite von meinem Blog. Wer sich dazu mit mir austauschen möchte oder als Referenten anfragen will, kann gerne hier einen Kommentar hinterlassen. Zum Start hier zwei Artikel aus dem Handelsblatt (Riskante Waffen gegen den Klimawandel) und der Süddeutschen Zeitung (Warnung vor dem Klima-Pfusch). It is the intentional, large-scale manipulation of the earth’s climate system to counter anthropogenic climate change. There are generally two kinds of GE: Solar Radiation Management (SRM) and Carbon Dioxide Reduction (CDR). While SRM tries to reflect the sun’s heat away in order to decrease global warming (e.g. by having reflective roof-tops or spraying sulfur aerosols in the atmosphere), CDR aims at reducing the amount of CO2 in the atmosphere (by capturing and storing it somewhere, e.g. in the oceans or in the soils). In order to understand GE, it is of profound importance to get an idea of the global carbon circle (and why we cannot just play easily with it). Some call it „Climate Engineering“ (like the good people from IASS in Potsdam) but this is seen by others as a way to distract. The IPCC in its next (fifth) Assessment Report will call it „Geo-Engineering“, thus formally establishing this term. What research was done so far and where do I get more information? There are several studies and publications out on GE by now. Hot-Spots seem to be the US, UK and – surprisingly – Germany. The German Research Ministry (BMBF) published a huge study on the topic (German version here) while the Federal Environment Agency (UBA) made a shorter and more political piece on it (here). Other landmark publications include Paul Crutzen’s articel on SRM in 2006, the Royal Society Report (2009) and among others the UNESCO-briefing and etc-group’s „Geopiracy„. The etc-group has made a map of where GE has/is happening on the globe. Unfortunately, they mix GE with weather-modification. According to the popular definition of GE (see above), these are different things. Thus, the map looks very full. Look for the SRM and ocean fertilization to see the main hot-spots of highly controversial GE-practices! Indeed, some GE-ideas are outright crazy. Think of huge mirrors in space or gigantic machines sucking CO2 from the air. But then again… possibilities are infinite. I first came across the topic in 2011 and quickly ended up reading more about it. Having talked to Pat Mooney and other activists about this, I decided for myself to be part of this evolving field. This is not only something entirely new and challenging for politics and science. This is intellectually a new frontier. And more to it: this research-field is in the making. As we go, the things unfold. There are (almost) no white old men having the cake divided between them. We – young academics, activists and thinkers – can truly have an impact, learn and form at the same time. For friends and colleagues, I gave some introductory presentations on the topic. I wrote an article in the German leftish magazine „Analyse & Kritik“, warning against Geo-Engineering becoming reality by a new „shock doctrine“ induced through climate-catastrophism. 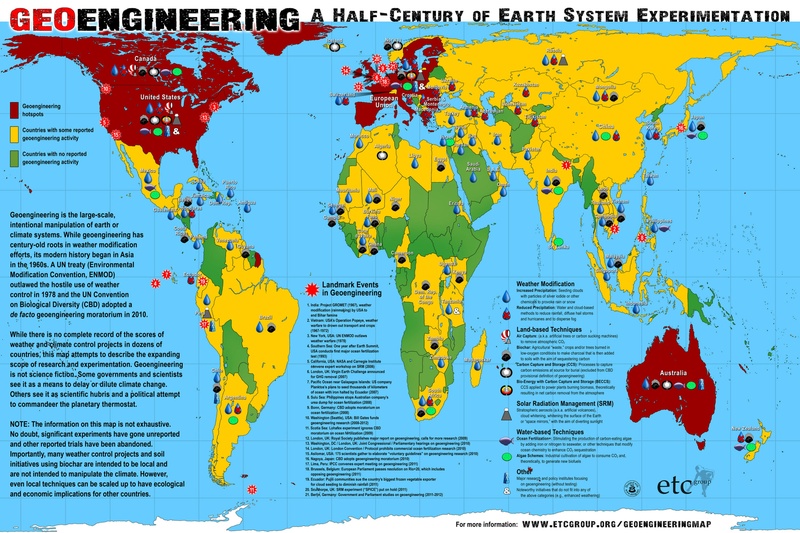 Please also note this publication I wrote for the Heinrich-Böll-Foundation on „Geo-Engineering: Is there a Plan(et) B?“ in 2012.
and this collection of 20 reasons against Geo-Engineering.